With 200 pages of data analysis and numerical computing tutorials at your disposal this completely free title offers you the chance to discover how to make the most of IPython right now. Discover why Python is so loved in the data world and revolutionize your work today! This book is a beginner-friendly guide to the Python data analysis platform. After an introduction to the Python language, IPython, and the Jupyter Notebook, you will learn how to analyze and visualize data on real-world examples, how to create graphical user interfaces for image processing in the Notebook, and how to perform fast numerical computations for scientific simulations with NumPy, Numba, Cython, and ipyparallel. By the end of this book, you will be able to perform in-depth analyses of all sorts of data. Cyrille Rossant is a researcher in neuroinformatics, and is a graduate of Ecole Normale Superieure, Paris, where he studied mathematics and computer science. He has worked at Princeton University, University College London, and College de France. As part of his data science and software engineering projects, he gained experience in machine learning, high-performance computing, parallel computing, and big data visualization. He is one of the main developers of VisPy, a high-performance visualization package in Python. 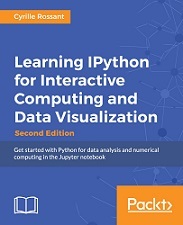 He is the author of the IPython Interactive Computing and Visualization Cookbook, Packt Publishing, an advanced-level guide to data science and numerical computing with Python, and the sequel of this book.